Tulips are traditionally a spring flower, but they can be grown year-round without soil in a glass container. The bulb sits above water and the roots sprout down into the water, encouraging the bulb to grow. This method works for most bulbs, including Tulips. The Tulip will continue to grow above the water, creating a single flower that works as a centerpiece and adds color to a room throughout the year. Growing Tulips without soil allows you to see the rooting process and keeps the project simple. The first things you need are healthy, big bulbs. Then you need to choose a container. 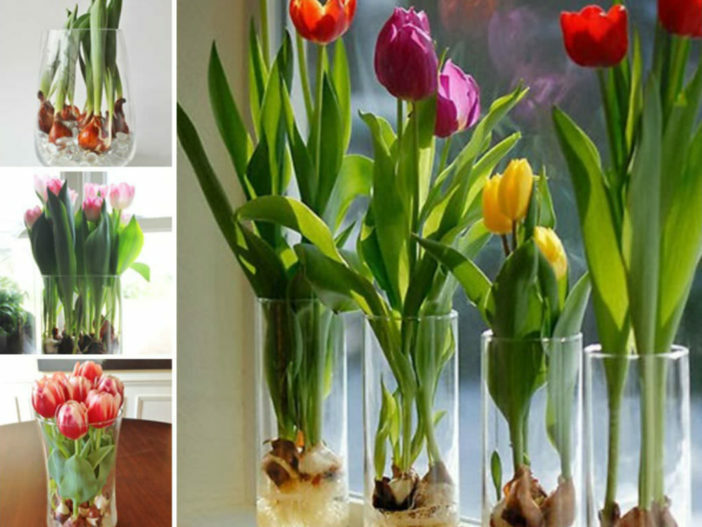 A glass vase is a good choice because its height gives the tulip leaves and stems something to lean on as they grow. You may also opt to purchase a forcing vase, which is curved to allow the bulb to sit just above the water with only the roots in the moisture. These designs minimize rot when growing tulips in water. Pre-chill your bulbs in a paper bag in the refrigerator for 12 to 15 weeks. You will need gravel, rocks or glass beads to line the bottom of the vase. Fill the vase 2 inches (5 cm) deep with rock or glass and then place the tulip bulb on top with the pointed area upright. The idea is to use the beads or rocks to hold the bulb itself out of the water while allowing roots to receive moisture. Fill the vase with water until it comes just 1 inch (2.5 cm) from the bottom of the bulb. Move the bulb and vase to a cool dark location for 4 to 6 weeks. Change the water weekly and watch for signs of sprouting. In a couple of months, you can move the sprouted bulb out to a lit area and grow it on. Choose a bright sunny window to place the vase. Keep the moisture level the same and continue to change the water. The sunlight will encourage the bulb to grow more and soon you will see the curved green leaves and rigid stem of a mature Tulip. Watch as the bud forms and then finally opens. Your forced Tulips should last a week or more. Once the bloom has faded, allow the greens to remain and collect solar energy to feed another bloom cycle. Remove the spent greens and stem and pull the bulb from the vase. There is no need to store the bulb because those that are forced in this manner will rarely bloom again.